Recycling and reusing is becoming a growing trend for artists and designers. Likewise, a lot of designers have tried to put old glass bottles to use and give them a new lease of life that is also beneficial and aesthetic too! 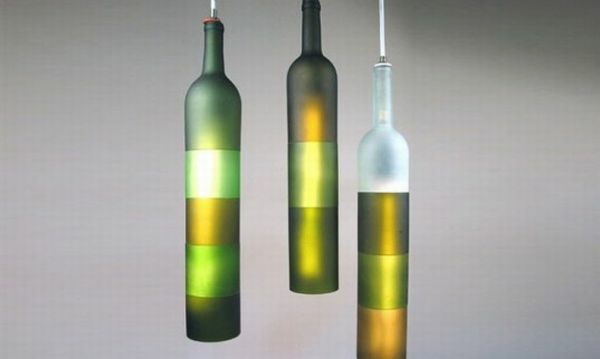 Here are a few creations by designers in which old tinted wine bottles have been used to make amazing products which are an inspiration for people to seriously undertake recycling and experiment with such products. These amazing creations out of old wine bottles by Jerry Kott are called the Khrysalis and Kortex lamps that are amazing light fixtures. These lamps have an amazing finishing that makes the wine bottles look colorful and perfect for any home as the center of attraction. They also emit soothing light as well! The GrowBottle are an amazing way to create your own personal hydrogarden inside old wine bottles and to repurpose them in a clever fashion. This relatively inexpensive kitchen garden can be all yours by simply following the instructions to grown your little plants and you will have them growing in no time using the simple principle of hydroponics! Each set comes with a special stylized wine bottle, heirloom/organic seeds that are USDA certified, wool wick, clay pebbles, plant nutrient, a decorative ribbon, a cork coaster and of course soil. 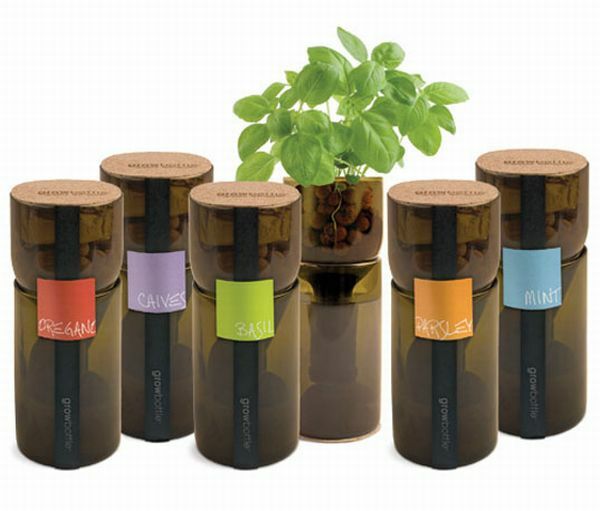 You can get the GrowBottle in give variations such as basil, oregano, mint, parsley and chives. 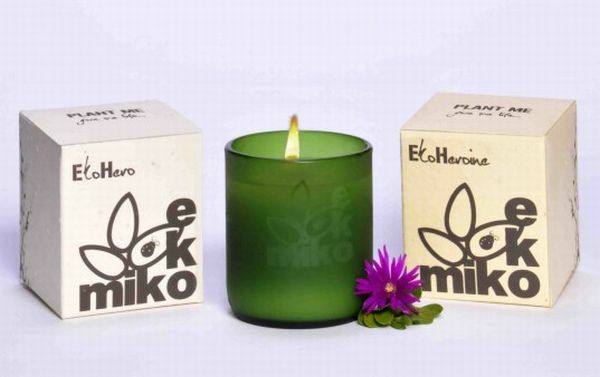 The EkoMiko candles are perfect for gifting with their rejuvenating aromatherapy. However, the containers that contain these aromatic candles are made out of old wine bottles. Created by Izabella Miko who is an environmentalist as well as an actress, these luxurious candles are made by repurposing old wine bottles. 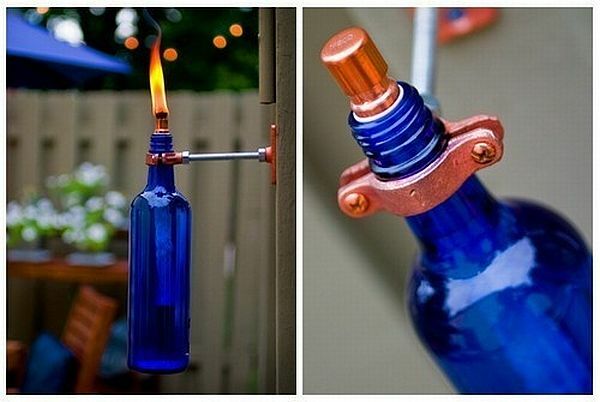 Old wine bottles can also be used to function as outdoor torches that are useful for repelling bugs and mosquitoes. Not only are these glass torches sturdier but they also have a very modern look. Manufactured and conceptualized by Gerardot&Co., this design can be accomplished with their tutorials on how to do-it-yourself. All you would require to make your very own wine bottle torch would be a bolt, a couple of copper fittings, a few nuts, a standard torch wick, a bolt, a mounting plate and oil. Now you can recycle your old wine bottles to turn them into a bartender calling system which is an innovative creation by Doyeop Ki, an industrial designer who has devised this mechanism for a restaurant. 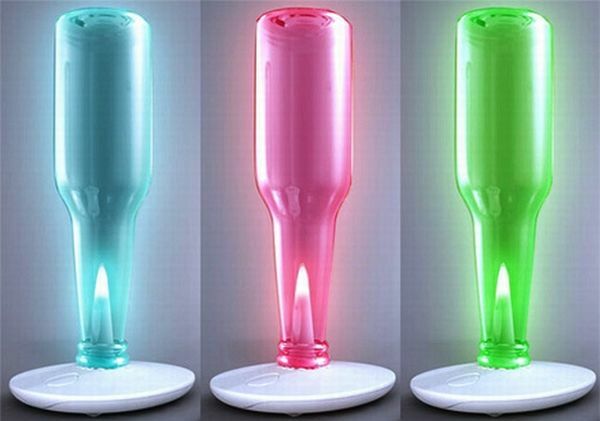 The different colors of the bottles stand for different coded signals in order to catch the attention of the waiter when your voice is unable to reach him./her in a crowded restaurant. Deby Cowden, an artist who has been working with glass for around 15 years, has indeed transformed the old wine bottle in a very artistic and stylish manner. This flattened tray made out of a glass wine bottle is highly functional and a great idea for recycling glass bottles. Deby along with her husband give different designs and shapes to the bottles and have a flourishing business called Blue Bag. 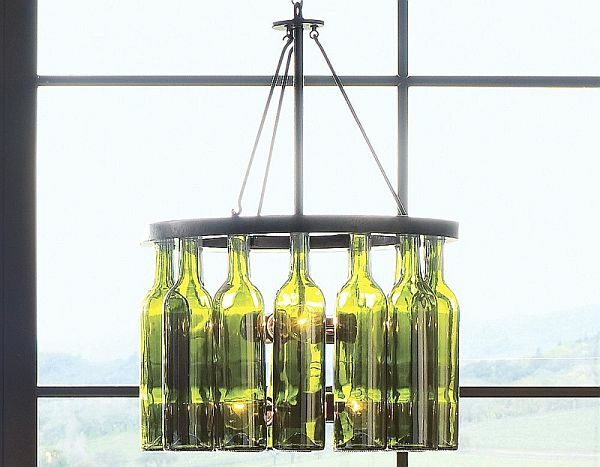 Pottery Barn’s Wine Bottle Chandelier is a very elegant light fixture that is perfect for the wine enthusiasts. This amazing lighting equipment weighs nearly 30 pounds and is suspended by using a 6 feet long chain. The bulbs inside this chandelier have the capacity to hod 460 watt bulbs that provide brilliant diffused illumination through the green tinted glasses. 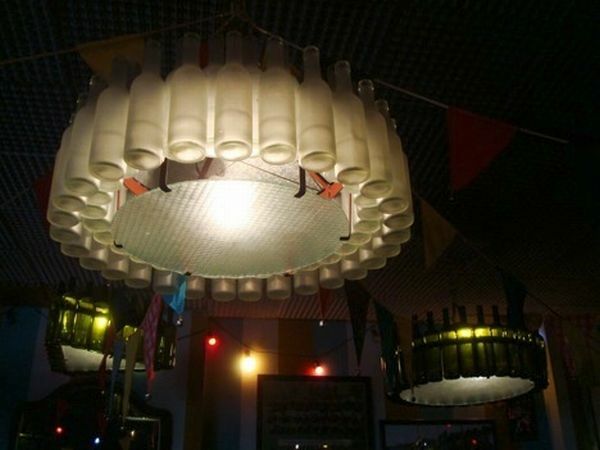 The La Dorita chain of restaurants in Buenos Aires, Argentina have adopted green values to their food business by using obsolete wine bottles to decorate their interiors. Each one of their outlets has various creations out of old tinted wine bottles, decorating balconies, turned into chandeliers and so on. These wine bottle creations not only save the environment from glass waste but also enhances the ambiance of the restaurants too!